Brownhurst NOT a Danger to Public Safety! Sunday I drove out to Kirkwood to photograph Brownhurst, the landmark shingle style mansion on the edge of Vianny High School's campus. I was expecting to find a deteriorating structure showing the tell tale signs of 20+ years of abandonment. What I found however was a beautiful home that while neglected and in need of renovation, is very much intact and clearly not a threat to anyone's safety, much less the public. In fact the most deterioration that I found in the entire structure is the roof of the wrap around porch. The first thing I noticed as I walked around the house is that the main roof, which is slate seems to be in surprisingly good shape. 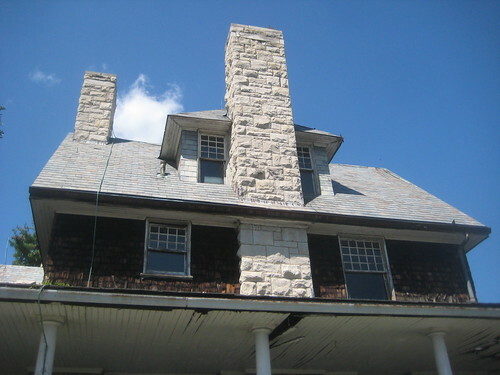 There are almost no missing pieces of slate on the main roof and only a few missing here and there on the vertical cladding of the third floor gable and dormer walls. A stone bay on the north end of the home has a strange makeshift roof over its second floor balcony, but this seems only to have helped protect the home as you will see below. As you may have read already, the owners of this mansion, the Society of Mary want to demolish the structure, claiming that it is unsafe, and a hazard to students at nearby Vianny High School. 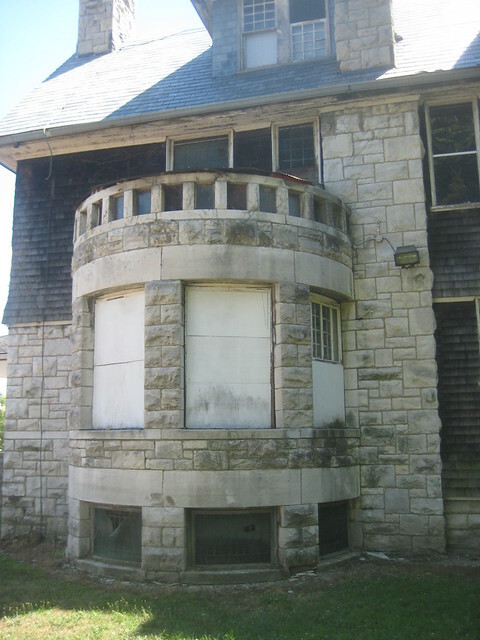 They convinced the City of Kirkwood to condemn the home and grant permission to demolish the home in May, but the Kirkwood Landmarks Commission has issued two stays of demolition, with the current stay expiring on September 9th. 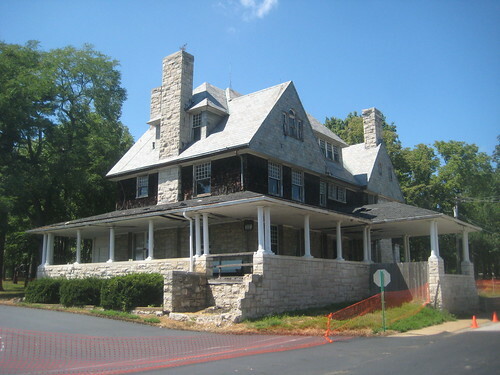 On Monday the Kirkwood Landmarks Commission released a press release stating that the Society of Mary will sell the mansion and provide $30,000.00 toward moving costs for $1.00. A serious offer must be made before September 9th or the historic mansion will be demolished. 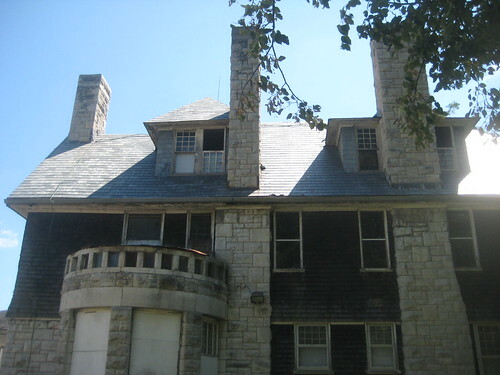 Another view of the mansion shows the main roof to be in very good condition. On Sunday the basement door at the rear of the house was wide open (this has now been closed and secured), so I decided to take a look at the condition of the interior of the mansion. I was shocked at what I found. The entrance hall of the mansion is a large wood paneled room with a stained wood ceiling with decorative beams. A beautiful brick fireplace is near the grand stair. This room like much of the mansion's interior is in pristine condition with no signs of water damage or any type of structural deficiency whatsoever. Another view of the entrance hall. The dining room also shows no signs of water damage or other issues except peeling paint, even at the round bay that has the makeshift roof covering the balcony above. The library, which has three sets of built-in glass front bookcases and an ornate fireplace also show little signs of damage. Ornate newel posts at the stair to the second floor. The paneling in the entry hall is continued up the stairs and punctuated by three beautiful stained glass windows. On the second floor, this large bedroom which features an unusual corner fireplace was apparently used as a classroom at one time. The second floor rooms typically have some small areas of plaster that have fallen from the ceiling, but again the level of damage is minimal. A fireplace in another front bedroom. Hardwood floors throughout the mansion are in excellent shape. This bedroom features a Jefferson window that opens out to the balcony over the stone bay. 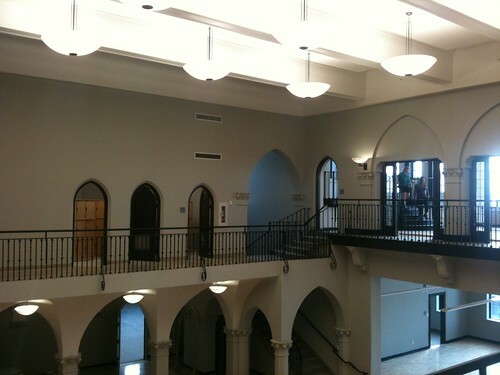 The stair hall at the second floor. A broken out window over the stair to the third floor has let in water which has caused some damage to this stair. More photos of the interior and exterior of the beautiful mansion can be seen in my photo set on Flickr. 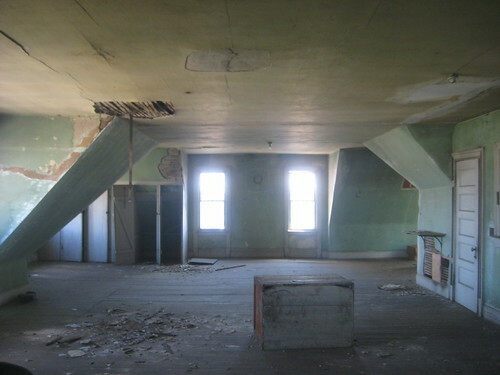 A large open room occupies the space of the third floor over the main portion of the mansion. Again, you can see that there is a little more fallen plaster, but not nearly what I expected. Over the rear wing of the house there are several small rooms that were likely servants quarters as well as a narrow service stair connecting al three floors. It is evident that there may be a few small scattered roof leaks and several open windows on the third floor are causing moisture damage in the immediate area of the window. Overall though, the condition of the structure of the mansion is solid. It is in no way a danger to anyone, and the call for demolition by its owner is completely unjustified. A few weeks ago I took a tour of the soon to open Grand Center Arts Academy which is occupying the newly renovated Beaux Arts Building across from Powell Hall in Grand Center. While on the tour, the staff person who was leading us confirmed that as the school grows its enrollment, it will expand into the adjacent Sun Theater, which will be renovated into a 1500 seat venue for their use. The renovation had been rumored for some time and was reported as being in the "very very early stages" in an article on Stl Today last December. A more recent article in the St. Louis Business Journal projects the cost of the Sun Theater's restoration at $12 million. 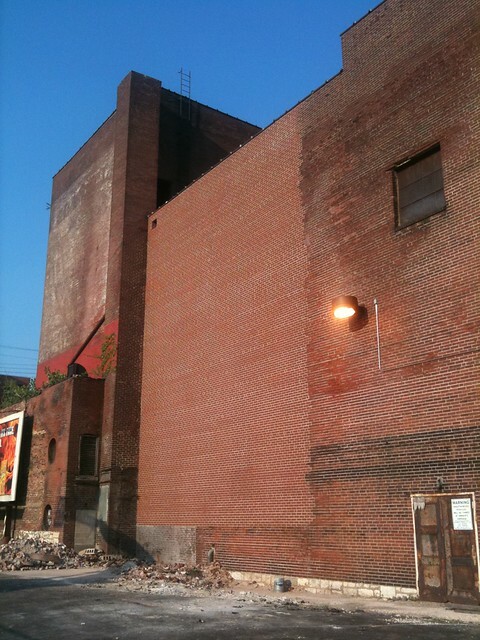 In May of this year however, Michael Allen reported that delamination of brick on the theater's west wall had prompted LRA, its current owner, to issue an RFP for demolition. This is odd since the Building Division last inspected the theater in 1998, and it has never been condemned for demolition. After the tour of the school I walked over to discover that the damaged wall has recently been completely re-built. 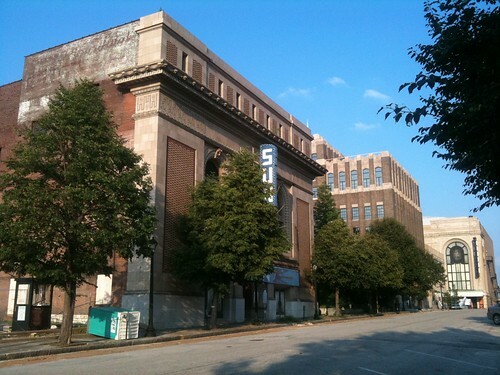 Prior to this latest incident, for several years the "plan" for the Sun under Grand Center's ownership was to slice off or dis-assemble the theater's facade and move it to Grand Boulevard south of Powell Hall as part of a new building to be constructed there. The remainder of the theater would have been demolished, but fortunately this half-baked scheme never came to fruition. Back at the new Arts Academy the former halls of the Knights of Pythias have been transformed into dance studios and a gymnasium. 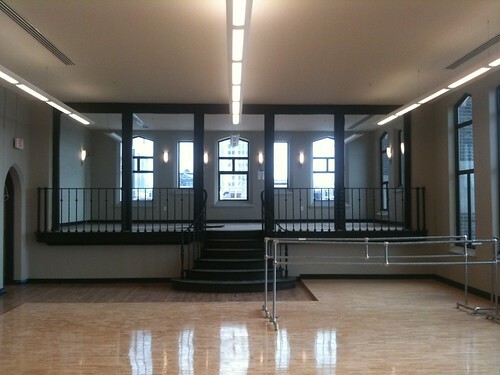 The new dance studio at the upper level of the halls. The new Arts Academy is an ideal use for this unusual building, as it is able to use the these large spaces without chopping them up into smaller rooms. The former parking garage portion of the building has been transformed into classrooms. This one at the top of the former split level garage will be a general art room. All the other former garage levels have a typical ceiling height of about 10 feet. 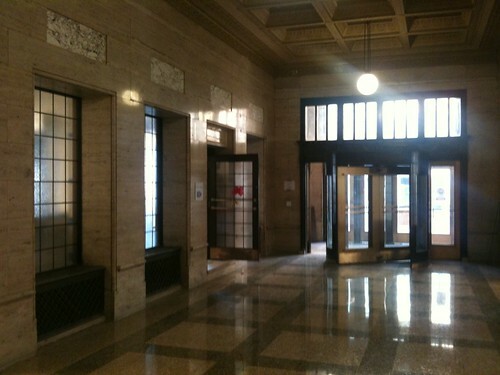 The original lobby of the building is in pristine condition. 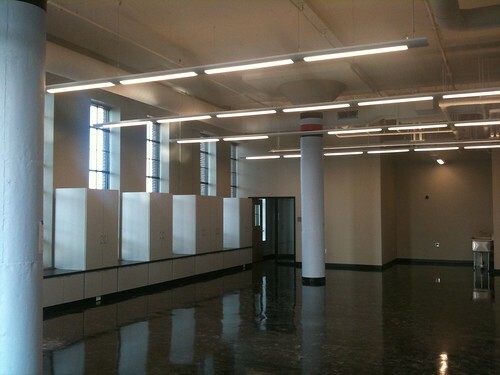 The storefront spaces facing Grand on both sides of the lobby will become the school's cafeteria. Super graphics are back!... 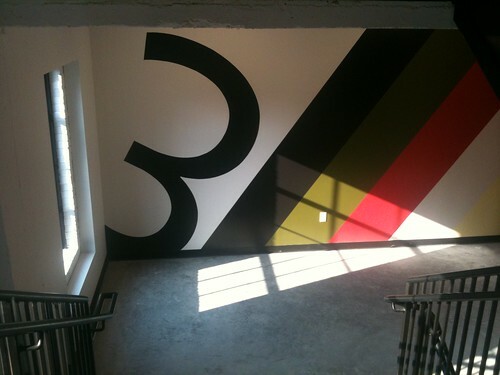 in the stairwell that connects the former split levels of the garage. 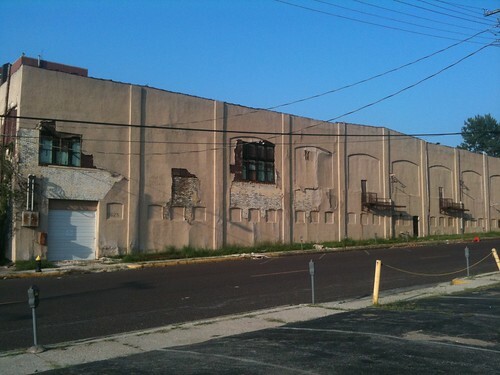 Unfortunately across Delmar from the rear of the Sun Theater the Palladium Ballroom building sits in limbo as stucco applied to the brick and covering the windows crumbles to the sidewalk below.